Manipur PSC Recruitment are 311 posts. Candidates applying for Manipur PSC Medical Officer Recruitment should have minimum age limit of 21 years and maximum age limit of 38 years. Eligible applicants with prescribed qualifications may submit online application forms through the PSC of Manipur official website @ www.empsconline.gov.in. Application submission starts from 20th November-2017 and closing date is 8th December-2017. Application processing fee for general candidates is Rs. 300/- and for SC/ ST candidates is Rs. 150/-. Candidate selection for this MPSC Medical Officer Jobs is based on written exam and Interview. 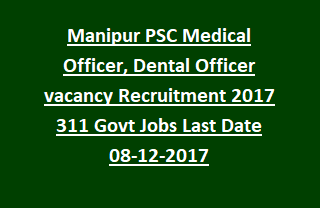 Other details of Manipur Public Service Commission Medical Officer, Dental Officer Recruitment Vacancy details, Application Procedure, Age limits, Pay Scale, Written exam dates and other Selection procedure are mentioned below. Total vacancies available in Manipur Public Service Commission Recruitment are 311 posts. 1. Medical Officer: 300 posts. 2. Dental Officer: 11 posts. Medical Officer: must possess recognized medical qualification in 1st or 2nd schedules or part II of 3rd schedule to the Indian Medical Act- 1957. Candidates must have completed compulsory rotating Internship. Dental Surgeon: Must possess recognized Dental Qualification in 1st or 3rd schedule to the Indian Dentist Act- 1948. Check the MPSC Manipur notification for qualification details. Minimum age limit is 21 years and Maximum age limit is 38 years. Pay Scale for the MPSC Manipur Vacancies is Rs. 9,300/- to Rs. 34,800/- plus Grade pay of Rs. 5400/- per month. Manipur PSC is going to conduct written test and followed by Interview to select candidates for Medical Officer and Dental Officer Vacancies. See the notification for written exam/ Interview Dates and Admit card available dates. For Differently Abled Candidates no application fee. Willing/ Eligible candidates read the notification completely to apply for MPSC Manipur Recruitment Vacancies. Get the application form from the official web link www.empsconline.gov.in. Submit the application in prescribed format through online from 20th November-2017 to 08-December-2017.